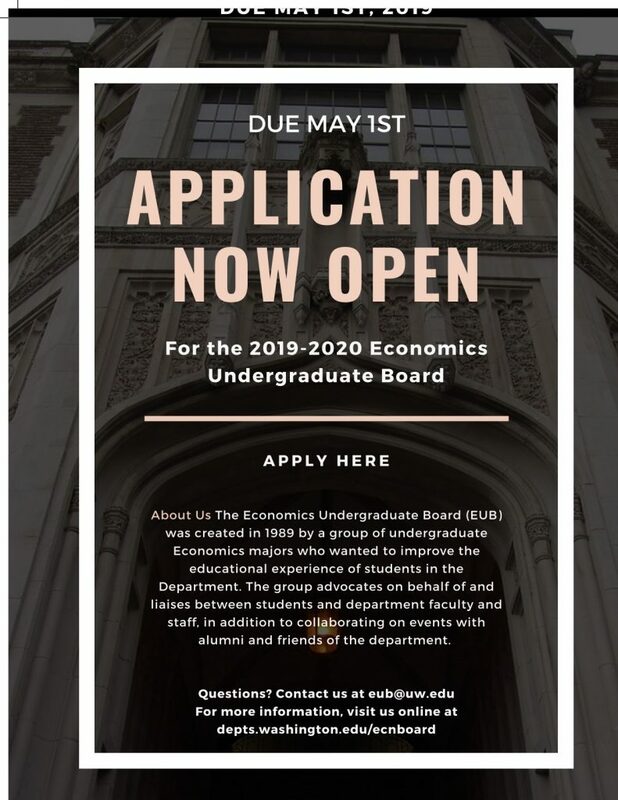 The EUB (Economics Undergraduate Board) is looking for exemplary undergraduate economics students who are interested in getting involved with the Economics Department at UW. The group advocates on behalf of and liaises between students and department faculty and staff, in addition to collaborating on events with alumni and friends of the department. The application is live now and opens until May 1st at 11:59 pm. Please see the attached flyer for more information and the link for the application. The EUB provides free tutoring hours daily for Econ 200/201 and Econ 300/301. Many tutors are also willing to help with specific 400-level courses that they have taken. See tutoring schedule for more information! This is the EUB’s quarterly newsletter, written by our very own members. Topics vary, so pick up a copy at the end of each quarter in the main office or read it online! The EUB surveys students in 300 and 400-level courses each year to find out more information about student concerns and trends. Results are available online. All schedules for events will be sent to the econmajor listserv, as well as being posted on our website and advertised by professors. Keep your eyes out for these great opportunities!